Anyone using GPS anti-theft tracker on their tools? I started thinking about putting a tracking sensor on some of them so that if the local toe rags do rip me off I can shop them in to the old bill (tell the police on them). Anyone had experiences of this tech? I see there are some bicycle ones that look pretty good. Re: Anyone using GPS anti-theft tracker on their tools? I have no experience with this but am tagging onto this thread and will be following it with interest. From your language I suspext you live in the UK, as do I and theft is a concern. Personally I don't have much time for the get a gun/big dog/alarm mine/CS gas spray/whatever replies as I don't feel they add much usefull to discussions on security. 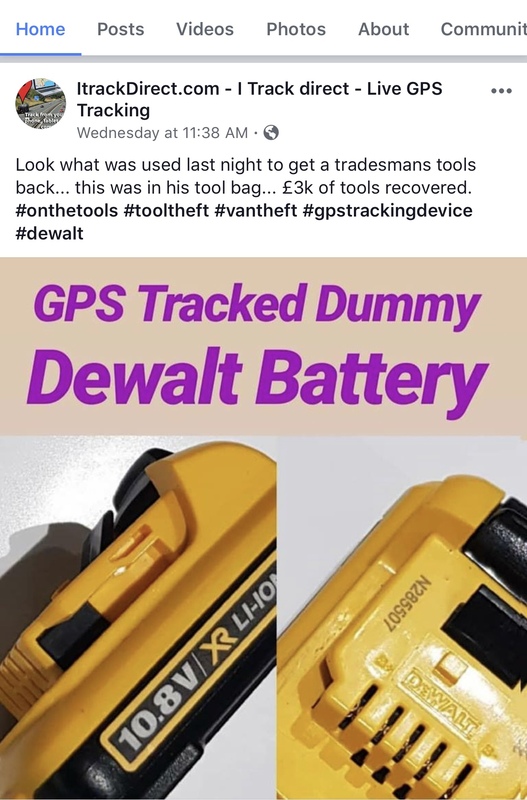 Marking tools and GPS tracking means you have a beter chance of catching the thieves and getting your tools back but Ive never been keen on the ones that require a hefty yearly fee. As Festools come with systainers one could think about putting such trackers below the molded plastic inserts. Questions are if one then remembers to keep these charged an if thiefs have similar ideas. I suspect you're thinking of one of the newer generation of Bluetooth Low Energy (BLE) trackers, Like Tile or Chipolo. They're cheap, small, and have low battery consumption. The problem with them is they're BLE, not GPS, which means they have a very limited range. Your phone - the BLE receiver - needs to be in range to locate the tag. Which is not much use if some scrote has whisked your Pretty's away to his/her fetid cave. BLE tracking services rely on a crowd concept - a whole bunch of users wandering around with their app running on their phone. If your tagged tool is stolen, then it needs someone in that crowd to pass close enough to the stolen device for their phone to detect the tag, and then alert you. I'm not sure how much penetration these crowd networks have at the moment- I looked at the tech when it was just getting off the ground, and decided it wasn't worth it at the time. This may have changed as popularity increases, and is much more likely to have achieved a useful coverage in the UK where your population density is quite high. There was some muttering about UK police carrying detectors, but I'm not sure what (if anything) happened to that. The alternative is a true GPS device, but these are more expensive, bulky, and draw much more power, so battery life and recharging become an issue. They're great for cars as they can be hidden, and have a big power source to draw from. Less useful in a systainer, but some cunning engineering could see you fit one with a disguised charging connector. At some point, the two techs will combine in some way and we'll get that cheap, low power, fully trackable device, but it's not here yet. I go by the idea of If people can't see it then they are less likely to nick it so I don't have a signwritten van for a start. Then its got a large toolsafe in it, big enough to hold pretty much all of my day to day work tools. Then I have pretty much every tool engraved with my name, postcode and also the date I bought it (that last one is more so I know when the warranty runs out without ratching for the paperwork). Means it's more likely to make it's way back to me if the police find it but I would be interested in a good tracker for the van or possibly large toolboxes. Personally theres no way I'm forking out a few hundred quid on a yearly subscription to a tracker thats not much better than an old mobile phone... But I'm no expert on computers nor mobile phones so I'd like to see how that one could be done. I'd make sure to have serial numbers of them all recorded (pics of tools). Then you can have some basis to track craigslist (or similar) and the local pawn shops. Sadly Power tools are probably one of the most stolen things out there since they are one of the few things that is both worth a fair bit and generally easy to offload. Trackers just add up cost and hassle. I have no idea how much such things cost, but it's probably not nothing. Like someone mentioned, I'd focus more on having home owners insurance cover them. Biggest issue would be with tools that you can't replace because they are no longer offered. You should have 3 years theft guarantee from Festool for new purchases - with an excess - but after that, maybe something like Ping GPS. According to the specs, it should only need charging every 3-6 months if it is most static. Battery life will depend on your tool usage, movement and settings. If I was to get something like this, it would be an active GPS tracker with cellular service. IMHO the only option that makes sense. Question is: will an active GPS tracker work if inside a Systainer and/or under the inlay? Will it hold up if attached to a tool? Any added device needs a subscription, too. ... So it would be 109,87 in the first year for any tool getting an active GPS tracker. I'm the first one not to let a thief get away if anyhow possible. But I'm not sure active GPS tracking it's worth the cost for tool protection at these rates. Does anyone know what insurance for stuff inside work vans runs these days? As some have pointed out, when you buy a new Festool machine and register it, you are protected/insured against theft for 3 years and can buy a replacement at a very heavily discounted price. From your experiences it seems like the tech isn't there yet. I will beef up some locks and get insured for now. Would love to have something like this in the future though. Tool theft is a fairly significant problem here in the US as well, and the pawn shops tend to purchase paying perhaps 20% or so of face value (even though they will price them pretty near full price when they go out for sale. Someone mentioned that they thought that Festool does or should cover tool theft as part of their 3 yr. warranty. Here in the states they do not cover theft. Perhaps it is different there in the UK? But I would be surprised if it was. With regards to insurance that actually covers tool theft, that is a really tough policy to get. My work van was broken into one time where the thieves removed nearly $3000 in tools. I thought that I had a rider for tool theft as that was supposed to be included in the new policy. Except the agency conveniently did not include that rider even though they did remember having that discussion. However it turns out that even if they did carry that coverage they would have paid the claim and then dropped my coverage immediately. Having a policy cancelled/dropped becomes a part of your record and any subsequent insurance carrier will increase your rates a very significant percentage. That drop or cancellation becomes a permanent part of your record, and so does that increase in your premiums. In my case I have one drop on my record, and it still costs me +40% for my premiums. OUCH! All small contractors here in America who were insured by Zurich Insurance (and pretty nearly everyone who was a contractor then was insured by them) about a year after 9-11 happened were dropped. The reason given was that small contractors did not have a formal safety program and that made us to big of a risk. So the lesson here is be darn careful about shopping for insurance that would cover tool loss. And good luck. I did some research on this a while ago. I found that you have to pay a monthy fee for any type of GPS tracking. This one sounded promising. In your situation here in the US I might suggest looking at Cincinnati Insurance. I got that tip years ago here. For my tools I have two policies. My high dollar tools are listed tools. Serial numbers, etc. I pay a separate premium for them at full replacement cost less the deductible. Other non listed tools are on a depreciated basis less deductible (basically worthless). Find an insurance agent you can talk to in person and explain your concerns. As a follow up post, the tool theft program is only available in locations on the other side of the Atlantic Ocean. I tried a few years ago to investigate tool insurance for Foggers. Here in NA that is a captive audience directed to auto mechanics and the premiums are nuts. A very specialized market with limited oversight. I quit before I wasted more time. Thanks for sharing the info on the insurance. Although I don't do this professionally, I did have something stolen from my car recently, so I'm quite concerned about future thefts. Several cars in my neighborhood were recently broken into, many locked with active alarms. The alarms weren't tripped. I know physical devices are available which allow certain professions easy entry into vehicles. Unfortunately, electronic devices are also available which "sniff" the radio signals between key fobs and receiving units. Thieves replay the signal they captured, and the cars unlock and disarm any alarms. They then steal at will. Frightening! (Another reason why we can't have nice stuff anymore). A few decades ago, a guy in Colorado tired of having the tools stolen from his workshop. Several thefts had occurred, and he was fed up with the losses. As a defense against future thefts, he set up some sort of shotgun trap. Well, long story short, he bagged his quarry. Tremendous legal problems ensued. He barely escaped prison and a murder charge, mainly due to tremendous public outcry about the personal property rights. @Kodi Crescent , Regarding tools for those who use them to make a living: There are strategies to give some piece of mind. Based on a tip I got here on the FOG years ago I switched insurance companies and then implemented a tiered strategy. All of my most expensive tools (Festool and Others) are on a full replacement cost basis. So if my van was broken into and every Festool was stolen I would get new ones less a $500 deductible for the entire claim. I have to supply costs and serial numbers on an annual basis for that part of the policy. The remainder of my tools (hammers, screwdrivers, less expensive electric tools, everything else) are handled differently but my claims are handled on a depreciated basis. So if my Stiletto hammer was stolen today I would be getting probably 1/20 of the replacement cost. Insurance is out there. But there isn't any insurance for the dread of being violated by theft. When I read about those who have had to go thru this my heart hurts for them. For a non professional I would urge that they have a common sense real life conversation with their insurance agent who has sold them their homeowners or renters insurance and make them speak in non insurance speak. Ask about the availability of added insurance for that Felder Tablesaw or those $10K worth of tools in easily transported plastic boxes. And then also ask about what kinds of safeguards could be in place to reduce the premiums. Most people do not feel comfortable talking to their insurance company before there is a claim and they should. I came across this on Facebook and remembered this thread. I have no need for this type of tech and didn’t look into it. This may be an option or maybe not.